It is a market researcher’s job to research potential customers like bugs under a microscope. When they look at television and broadcast professionals, what do they see? It is a market researcher’s job to research potential customers like bugs under a microscope. When they look at television and broadcast professionals, what do they see? Last year, the Josh Gordon Group studied the effectiveness of marketing in the US broadcast industry. They evaluated the marketing effectiveness of the top 34 broadcast suppliers. Here are some insights they uncovered. Do you agree with them? The study found that the customers of each broadcast supplier rate that supplier’s marketing much higher than do its non-customers. This means that if your facility owns a Miranda router, you probably find marketing materials like ads, webinars, and emails from Miranda much more interesting and influential than if your facility does not own a Miranda router. But the study went even further, finding that most non-customers of a supplier are largely unaffected by that supplier’s marketing. When all the non-customers from all 34 companies were averaged together, only 10.7% reported being impacted by marketing from companies whose products they do not own. 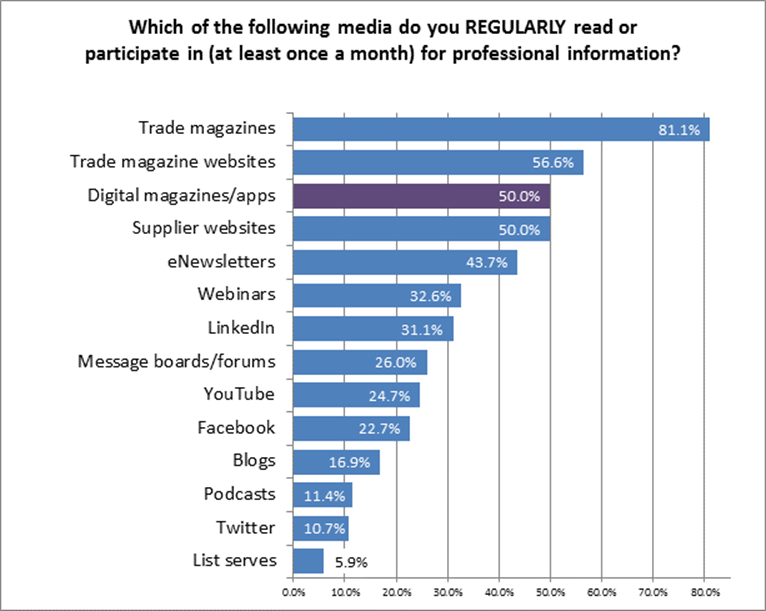 The next most frequently used medium was trade magazine websites, at 56.6%. Then a surprise: Digital magazines tied for third place with 50% of respondents saying they refer to them monthly. Interviews with industry gurus confirmed that many broadcast facilities buy tablets for their engineering staffs because of involvement in second screen content delivery, but it seems that those devices are also being used to read some digital magazines along the way. You find educational information from suppliers as motivational as promotional information in motivating you to buy. The survey asked respondents to rate the persuasiveness of different kinds of supplier-provided information in motivating them to buy. A variety of promotional information (such as testimonials and competitive product information) were assessed, as were a list of non-commercial information (such as educational white papers and tech training). In the marketing departments of some suppliers, educational programs often struggle for funding because it is believed to offer no tangible sales benefit, only goodwill. But from a buyer’s point of view, educational information is actually just as motivational as promotional information. The study focused on just the broadcast technology market but earned national attention as the first B2B study to call attention to: the ineffectiveness of marketing on non-customers, the impact of the shift away from third party media, and the growth of digital magazines. The Josh Gordon Group is currently conducting another study, based on the same methodology, for SIA, the Security Industry Association. Download the FREE 43 page study at THIS LINK.